California Drought and AGW, What is the Plan? California's 2015 snow pack, a traditional source of spring and summer water, comes in at 19% of of normal; winter rains did replenish some reservoirs, but nowhere near enough to meet summer demand. 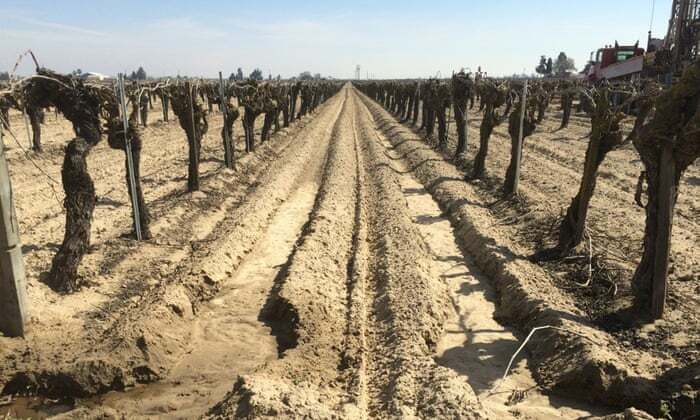 California supplies about 50% of US fruit, nuts and vegetables, yet farmers are forced to drill deep into aquifers for required water. In some places, the output is irreplaceable "fossil water", perhaps millions of years old. A greater problem is that no one knows how much water remains or even overall capacity. Regional circumstances vary, but at the core the lack of planning and long-term thinking is the most troubling part of AGW. Despite individual brilliance, collectively humans have difficulty moving past short-termism. Business as usual typically supersedes best practice. Unfortunately this comes at a time when the effects can only grow into a greater threat. Can we really afford to not at least have a contingency plan? This reality points to the need to address dual concerns: reducing greenhouse emissions AND developing contingency against probable climate disruptions. California's three year drought so far is paltry compared to megadroughts likely mid-century. That will arrive as population surpasses 9 billion. It will take more than a few years to figure how to cope with that reality.